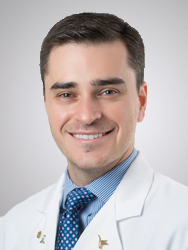 Dr. Simon Khagi is a neurological oncologist who joined the faculty of the University of North Carolina at Chapel Hill School of Medicine in 2016 as an assistant professor. Dr. Khagi holds dual academic appointments in the departments of Medicine and Neurosurgery. As the director of the UNC Brain Tumor Program, Dr. Khagi works in close collaboration with a wide range of supportive specialties to provide patients with a truly multidisciplinary approach to the treatment of central nervous system malignancies. His research efforts center around improving treatments for patients with aggressive brain tumors (i.e. glioblastoma) and metastatic disease to the brain from lung cancer. Specifically, his research focuses on novel stem cell-based therapies, neuro-immunotherapeutics, design of early phase clinical trials, and enhanced imaging techniques for brain tumors. Prior to joining UNC, Dr. Khagi completed a one-year training fellowship in neurological oncology at Duke University. In 2015, he completed a three-year combined fellowship in hematology and medical oncology at Tufts Medical Center/Tufts University School of Medicine. In 2012, he completed a three-year residency in internal medicine at Dartmouth-Hitchcock Medical Center/Dartmouth Medical School. Dr. Khagi is a 2009 graduate of the combined/accelerated BA/MD program at the University of Missouri-Kansas City School of Medicine.